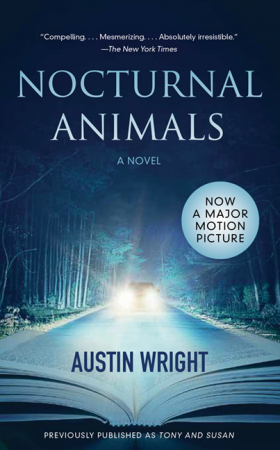 NOCTURNAL ANIMALS by Austin Wright. Susan is quickly drawn into the fictional life of Tony Hastings and his family. On an ordinary drive to their summerhouse in Maine the unimaginable happened. At first Tony is left emotionally paralysed by the violence done to himself and his family. Slowly, he comes to terms with the fact that it happened but is unexpectedly drawn in to the often unexplainable quest for judgement both he and the local police seem to need in closing the case of what happened to Tony and his family. 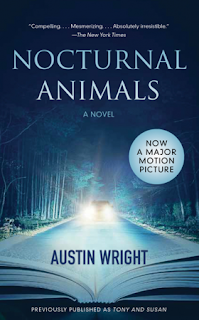 “Nocturnal Animals” is a book within a book that seemed like an interesting concept when I first read about it. The first part of the book held my interest because I got caught up in Susan’s excitement at digging into the manuscript. I could relate to her wanting a quiet place and a set time frame to do the book justice. Reading along with Susan I was as shocked as she was at what was happening to the Hastings family. When Susan had to close the manuscript to address her life (which I very quickly became bored with) I, like Susan, couldn’t wait to get back to the manuscript. Unfortunately that feeling really didn’t last much past the first third of both the book and the book within the book. I can’t say the writing was horrible – I’ve read worse – but the editor was asleep at his job on this one. This book was previously published under the title “Susan and Tony” so you would think this being the second go round the errors might have been caught? There were sentences that I had to read two and three times and still couldn’t make sense out of them. I just moved on hoping I didn’t miss some important piece of information. This does not endear me to the book I am reading. I also kept waiting for the book to fulfill the promise in the cover description, “Susan is plunged into the past, forced to confront the darkness that inhabits her and driven to name the fear that gnaws at her future and will change her life.” Yeah – didn’t happen. So why did I keep reading? There was an underlying sense that this book was going to surprise me with a big reveal at the end. I was optimistic that my fortitude would pay off. It didn’t. The ending I was expecting never materialized and in the case of both books I was left disappointed. I’m giving this one 2 stars because the first third was, aside from the editing, interesting. It was too bad the rest didn’t live up to the hype. This book has been made into a movie. I may watch it if it ever makes it to the small screen but doubt I’ll go out of my way to do so. 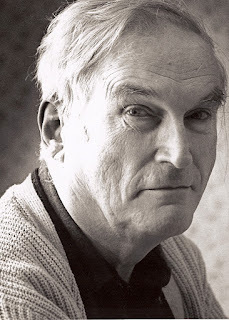 Austin Wright, an American novelist and English professor who died in 2003 at the age of 80. Despite having been praised by the likes of Saul Bellow, he remained little known in his lifetime. 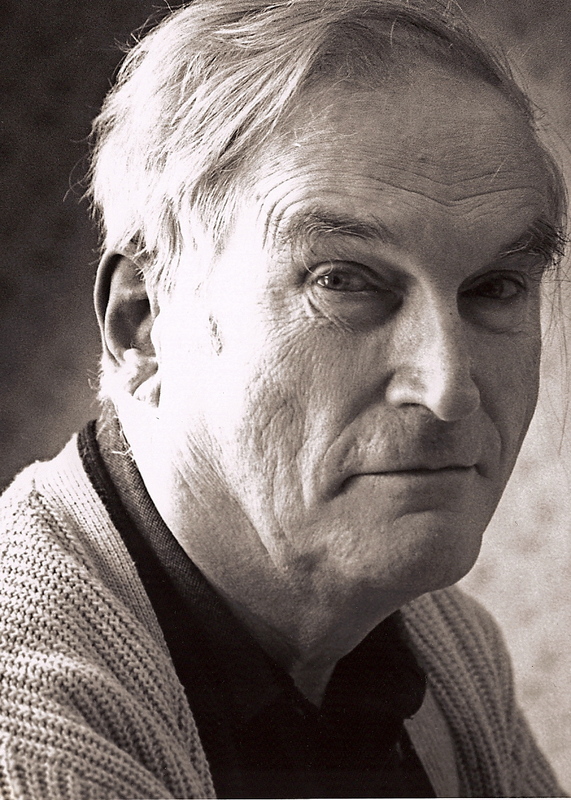 ‘He was interested in how the mind works,” Katharine Wright says of her father, “how it fools itself and how it tries to rationalize things.” Wright was an inveterate player of games and puzzles – at Christmas in 1974, he waited until everyone had opened their presents, then gleefully pulled out from behind the sofa a newly invented Rubik’s Cube he had bought and wrapped for himself. He was also a compulsive recorder of facts. On long car journeys, the rest of the family would tease him about all the information he had noted in his journal: where they stopped for petrol, what they ate and so on. 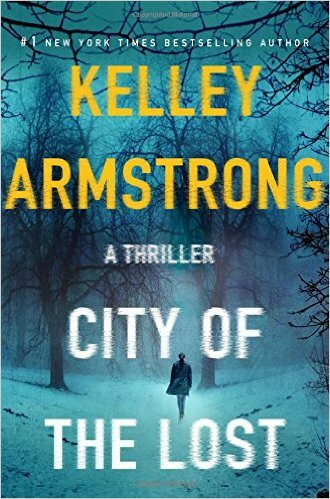 THE CITY OF THE LOST by Kelley Armstrong. Rockton is a unique place. It’s in the middle of nowhere and you will not find it on a map anywhere. Somewhere in the Yukon, Rockton is filled with people who found it necessary to disappear from their lives … some for their own protection and some to evade the law. Each must go through a vetting process and possess a significant amount of money to be accepted but only the Sheriff knows who is there and for what reason, yet even that information may not be trustworthy. As each person arrives they are given tasks according to their particular skill set so Casey quickly becomes a deputy … just in time to help solve a gruesome murder. In this, the first book of her new series, Ms. Armstrong once again does what she does so well – build a fictional world that is believable and unique. Whether it’s her “Otherworld” or Rockton she takes us just far enough out of reality to make it ring possible. An isolated town, a murder mystery and a little romance thrown in make “City of the Lost” an excellent read. Originally published as six mini novellas I’m sure the reader was kept in suspense from one installment to the next. I waited until all six parts came out in book form and am glad I did so. Although, let’s face it, it’s a great marketing ploy but I would have found it frustrating to read it in bits and pieces. Can’t wait for the next book in the series. I’ve been telling stories since before I could write. My earliest written efforts were disastrous. If asked for a story about girls and dolls, mine would invariably feature undead girls and evil dolls, much to my teachers’ dismay. All efforts to make me produce “normal” stories failed. Today, I continue to spin tales of ghosts and demons and werewolves, while safely locked away in my basement writing dungeon. The mission statement of this book can be found in the description on the flyleaf “to better understand the furry strangers in our midst”. Science writer Abigail Tucker does an admirable job but really, can anyone really understand cats? 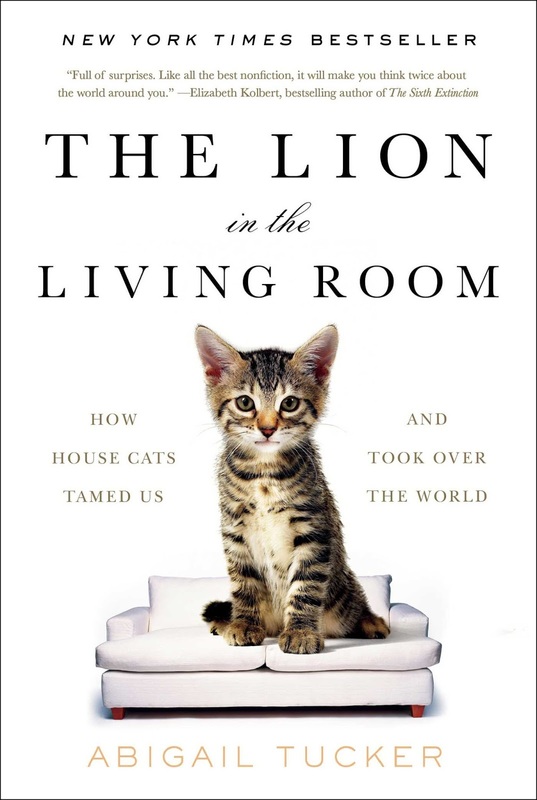 Ms. Tucker, a cat lover herself, takes us on a masterful historic tour of the world of cats and how they came to be the most popular of pets the world over – or rather how they invaded our lives and homes to ingratiate themselves into our lives – making us not owners, but drooling love slaves. If you are expecting a written version of a “cute cat you-tube” video BE WARNED, this book is anything but that. In fact if I didn’t know better I would think this book was written to dissuade anyone from ever cohabitating with a feline. Ms. Tucker takes her reader through the history of cats and how they, quite literally, domesticated (if that word can even be used in reference to cats) themselves and how they managed to travel the world over, sometimes much to the chagrin and detriment of local residents, both human and wildlife. Yes, she tackles the ugly problem of cats, domestic and feral, and their negative impact on the wildlife in their vicinity. Ms. Tucker seems to have a wide variety of scientists and researchers on speed dial and gives excellent insight into things such as the toxoplasma parasite and how it may have possible infected the human brain causes us to love our little fur-babies even more, why cats, despite the best efforts of humans manage to remain strong and plentiful in feral communities. From history to science, cats in literature to our obsession with cats on the internet, dogs vs. cats as pets and new specialty breeds such as rag dolls and werewolf cats Ms. Tucker has written a very comprehensive book that every cat owner/lover should read at some point. You may not like everything you read but it is worth knowing. While I believe Ms. Tucker has done very thorough research in writing this book I can not, because of personal experience with this amazing creature that is cat, quite bring myself to jump on the bandwagon of everything she has written … or course, that could be a touch toxoplasmosis talking? Read the book – you’ll understand. 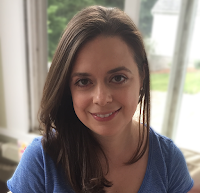 Abigail Tucker is a correspondent for Smithsonian magazine, where she covers a wide variety of subjects, from vampire anthropology to bioluminescent marine life to the archeology of ancient beer. 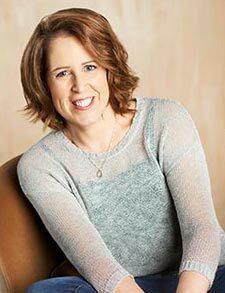 Her work has been featured in the Best American Science and Nature Writing series and recognized by the National Academies of Sciences. Previously she was a reporter at The Baltimore Sun, where she won Columbia University’s Mike Berger Award for feature writing and a National Headliner award. 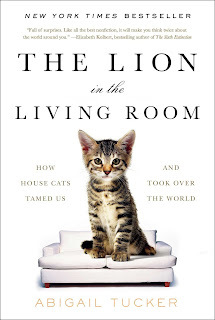 The Lion in the Living Room is her first book. A deathbed confession, a family curse, a dark and stormy night complete with a mysterious stranger; really, what more could you ask for in a horror story? As his father lies on his deathbed Paul Steele finds he can barely look at the man let alone offer him any comfort as he takes his last breaths. His father’s life-long quest to find peace in the bottom of a bottle destroyed Paul’s mother and alienated Paul. What the old man has to say before he dies does nothing to change Paul’s feelings, but now Paul may understand his never ending drinking. Paul’s father committed an unimaginable crime and avoided prosecution by making the proverbial deal with the devil. “We’re all damned. It’s just a question of when”. For Paul Steele the mysterious “when” turns out to be “right now”. 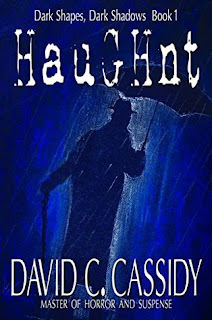 This short story is the first of Mr. Cassidy’s “Dark Shapes, Dark Shadows” series and after reading “HauGHnt” I am looking forward to what’s to come. Mr. Cassidy seems to enjoy taking an ordinary person with an ordinary life and putting them in the most extraordinary situation. It certainly makes for a chilling read. Short stories are not my usual go-to read because, by their very definition, they are – well – short. It’s difficult to come to care for characters in the few pages allotted to the read but Mr. Cassidy packs a lot into this one, so I found myself totally involved in Paul’s dilemma. 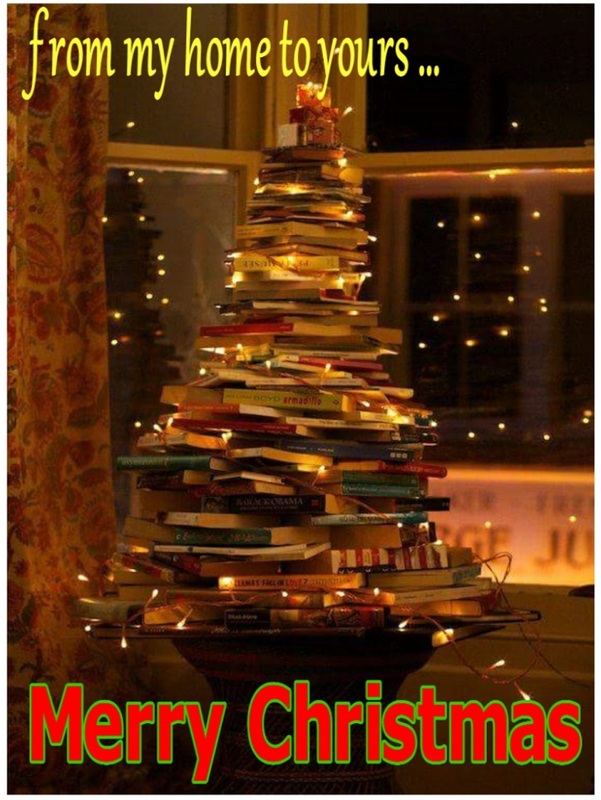 I couldn’t get to the end fast enough – in the good way! And the end? Paul shocked me as did HauGHnt and that’s always a good thing in a horror story. I admit to wishing the story were just a tad longer, but taking the “creep” factor into consideration I’m giving this one 4 ½ stars. 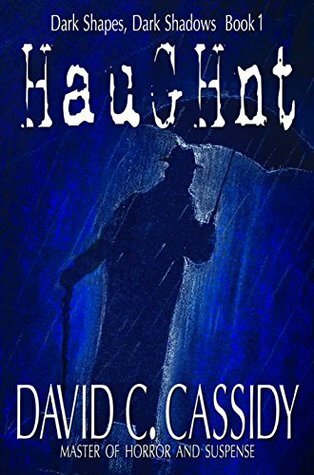 ABOUT THE AUTHOR (from his Goodreads page) Award-winning author David C. Cassidy is the twisted mind behind several best-selling novels of horror and suspense, Velvet Rain, The Dark, and Fosgate’s Game. An author, photographer, and graphic designer—and a half-decent juggler—he spends his writing life creating dark and touching stories where Bad Things Happen To Good People. 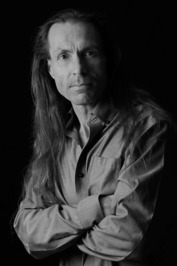 Raised by wolves, he grew up with a love of nature, music, science, and history, with thrillers and horror novels feeding the dark side of his seriously disturbed imagination. He talks to his characters, talks often, and most times they listen. But the real fun starts when they tell him to take a hike, and they Open That Door anyway. Idiots. David lives in Ontario, Canada. From Mozart to Vivaldi, classic jazz to classic rock, he feels naked without his iPod. Suffering from MAD—Multiple Activity Disorder—he divides his time between writing and blogging, photography and Photoshop, reading and rollerblading. An avid amateur astronomer, he loves the night sky, chasing the stars with his telescope. Sometimes he eats. (Blushing) - I have a favor? I find it difficult to reach out to people for favors but I’m tamping down my apprehensions and doing just that today. Feel free to act or ignore as you see fit. I mentioned a couple of posts ago that the end of last year brought some life changes – my job, of almost 20 years, was downsized right out of existence. I had other options within the company, involving less money and fewer hours, which I chose not to take. Turning lemons into lemonade I decided it was time try something I had been thinking about for a while. I am starting a small home-based business called “Stay at Home Kitty” and it’s a cat sitting service. When my daughter got married she had a destination wedding and I had four cats at home, one of which had to be sedated just to go to the vet so there was no way she could be boarded for a week … I’m sure she would have had seizures had she known we were even thinking about it. Of course, anyone who I might have trusted to look after my kitties was coming away with us for the wedding. What to do? I hired a lovely lady, “The Cat Lady” (since retired), who came in once a day to look after my kitties and bring in the mail, etc. I came home to happy, healthy and well-fed cats. At that time I was a bit envious of her job … seemed like a great way to make a living. So I’m going to give it a try while I have the safety net of unemployment insurance. My youngest daughter, who works in PR has helped me a lot and advised me to set up an on line presence. 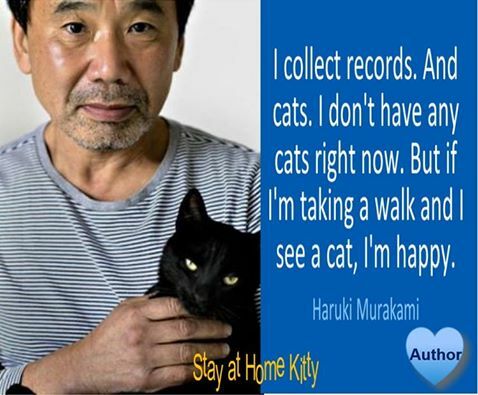 I have made a Facebook page called, of course, Stay At Home Kitty. 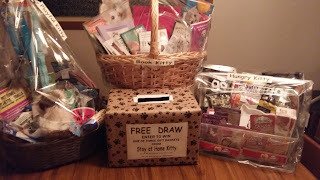 This weekend I am participating in a local trade show and offering three gift baskets for a draw – and wouldn’t you know it (wink, wink) some items I purchased did not make it into the baskets – so, I’m offering them as a giveaway on my FB page. This weekend, all you have to do is "like" the page and leave a comment on my Saturday post for the chance to win one of five prizes … all of them cat related and some of them books. It would be great to have a few more “followers” for this “on line presence” my daughter recommended. Sooooo???? 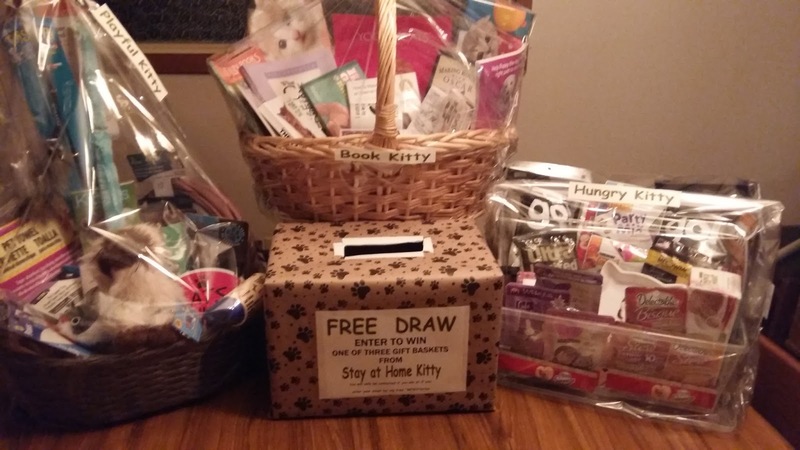 If you are on FB and want to meander over to Stay at Home Kitty this weekend to paw the like button and leave a comment it would be greatly appreciated and you might just win a prize. * Posts are (I think) amusing – no politics, abuse stories or sad stuff. I also have a website that is now up and running (www.stayathomekitty.com). 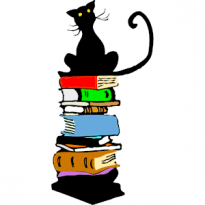 It has a “Mews and Fun” page which I hope will be somewhat interactive so I have a “Kitty of the Month” and a “Book of the Month” (fiction or non-fiction, cat related of course). Sooooo???? 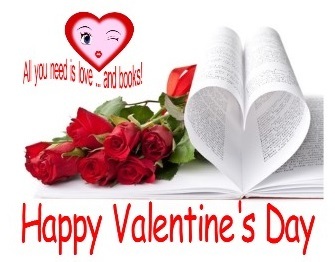 If you have a book recommendation send it along to me at stayathomekitty@gmail.com along with a link to your review. And, if you would like your kitty to be a “Kitty of the Month” send me a pic and a little bit about your fur baby(s) and I’ll post that too on my website and my FB page (and I know there are A LOT of cat lovers on Booklikes … sorry dog folks, I love them too, but ...). “Books of the Month” and “Kitty of the Month” will also be included in my monthly “Mews”Letter that can be subscribed to on my website’s contact page. Thanks for reading this ... it's the one and only time I'll mention this ... PROMISE!! Nina’s life has slipped off the track a little bit. She is a pariah among her fellow police officers for filing a sexual harassment suit. Now she is working on dead files in the basement of the building where she has entirely too much time to think about her husband who is lying in a coma after attempting suicide. Helgi is a photo-journalist doing a photo shoot on a very small, very remote island where a team was sent to refurbish a defunct lighthouse. Helicopter troubles keep them on the island longer than usual and during a raging winter storm one of them disappears. Noi and Vala return from a trip to the United States where they had house-swapped their home with an American couple. Coming into their house they sense that something is off but cannot put their finger on what it is. What do these people have in common? At one intersecting point in their lives they lied! Now, someone or something wants them to pay for those lies. 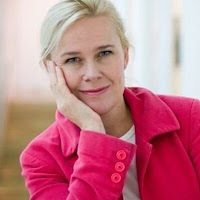 I enjoy Ms. Sigurdadottir because she give me the all the thrills and chills I love without the “in-your-face” horror. 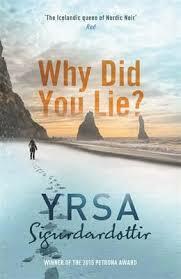 In “Why Did You Lie” she tells four seemingly unconnected stories that each hold your interest independently but when she brings them together at the end of the book it is in the most deliciously unexpected way. If you enjoy mystery thrillers with a touch of what might or might not be a supernatural element I highly recommend you add Ms. Sigurdardottir to your TBR. Yrsa Sigurdardottir works as a civil engineer and lives in Reykjavik. 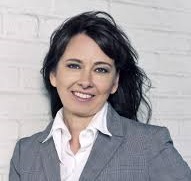 She is the author of six novels in the Thora Gudmundsdottir series and two previous stand alones, “I Remember You” and “The Undesired”. All of her books have been European bestsellers. 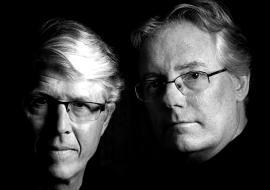 In 2011 "I Remember You" was awarded the Icelandic Crime Fiction Award and was nominated for the Glass Key. The most recent Thora novel, “The Silence of the Sea”, won the Petrona Award in 2015. Have you ever taken a vacation and made sure to include a visit to a place or site that was mentioned in a book you read? I know I can’t be the only one! Over the years I’ve managed to cross a few things off my bucket list of places to visit … The Gardner Museum in Boston, The Cloisters, the Library, the Met and Central Park in NYC, The Art Institute in Chicago, and The Louvre and Versailles in Paris – yes – museums and galleries seem to be the theme of prominence. My travel bucket list just got a whole lot longer after reading this book (now if only my lottery numbers would hit). If this book is any indication they should definitely hire authors to write travelogues. In the stories selected for this book it is interesting to note that most of the museums the authors chose to revisit were small, often obscure, places that spoke to them on a personal level. The galleries and museums range, geographically, from New York City to Zagreb and from Stockholm to Australia. Each article is, of course, written in the first person and many have a conversational tone that made this non-fiction book very easy and most enjoyable to read. Each author’s reason for their choice of museum was as varied as the choices themselves. 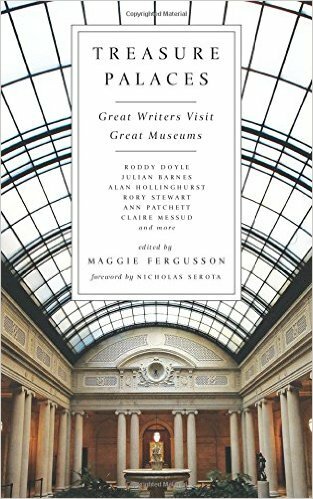 If you enjoy art galleries and museums or are an armchair traveler, like myself, this book is a must read. I promise you will have a few places to add to your personal bucket list as well. So which ones in particular made my list? This museum is a collection of items donated by people who have lost their loves. A married man donated a shaving kit given to him by his 17-year old mistress in the 1980’s. When he donated the shaving kit he wrote a note that read, “I hope she doesn’t love me any more. I hope she doesn’t know she was the only person I ever loved.” The museum contains everything from stuffed animals and silk dresses to hats, books and a special pair of motorcycle boots donated by a young man who purchased them for his girlfriend Anna. He and Anna eventually broke up and over the years several other girls wore the boots on the back of his bike but in his mind those boots would always be “Anna’s boots”. Exchanging tokens of love is something we all do and all the best sources advise to get rid of those things if the relationship ends. Sometimes we just cannot bear to do that so why not give them a home in the “Museum of Broken Relationships”? One article in this book moved me to tears; In Flanders Fields Museum, Ypres (Michael Morpurgo) so this museum is on my list of places I will probably never seek out, for the same reason I did not go to Ground Zero when I was in NYC and will not visit the 911 Memorial. I will not go to Auschwitz, nor the Holocaust Museum. As touchingly as Mr. Morpurgo wrote of the museum and its stories, and as much as I enjoy most aspects of history these museums are difficult to walk through. I did find myself at the memorial for the Oklahoma Bombing. It was incredible and it stays with me to this day, so many years later and that’s why I won’t go back there or seek out Flanders Fields … the voices of the ghosts are too loud and haunt me for too long. The above were some of my personal favorites but all of those included in the book were wonderful. 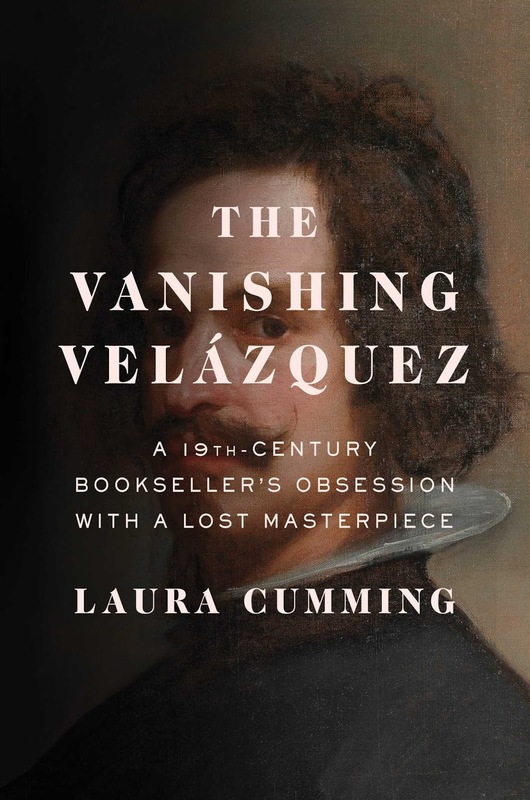 I borrowed this book from the library but it will definitely find its way onto my permanent bookshelf sometime in the future, if only to use as a reference when I accumulate enough Air Miles to take another amazing trip. Highly recommended and definitely 5 stars. Maggie Ferguson was for many years the literary editor of “The Economist’s” lifestyle magazine, “Intelligent Life”, and is the author of two biographies, “George Mackay Brown: The Life” and “Michael Morpurgo: War Child to War Horse”. I always read in bed before going to sleep, but sleep beckons too easily so if I want to really have some reading time I do it in the kitchen. Most of the time it’s a bookmark, but in a pinch almost anything will do. Yup … I usually have a cup of coffee or tea on the go. If I am alone I read while I am eating meal and I have no qualms about going out to restaurant by myself and reading while I eat. 5. Multi-tasking: music or TV while reading? Nope. I used to listen to music but now I can’t seem to multi-task as well. 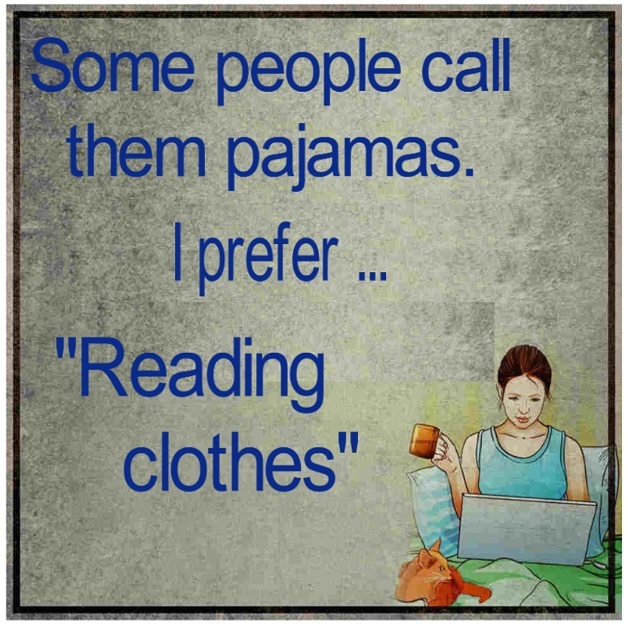 I usually have a “real” book and an audio book on the go at the same time. If I need something portable sometimes there will be a third one open on my eReader too. 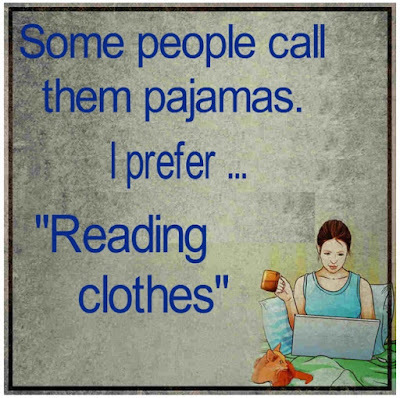 Pretty much anywhere I can sneak in a few pages. 10.Breaking the spine or keeping it like new? I can’t believe it’s already the first of February and I haven’t posted one review. In my own defense I got that horrific cold that’s going around – it’s a bad one – so stay healthy everybody. I still have the tail end of the cough. Also, every time I fired up the computer I had other things to do on it. After being downsized out the door at my job at the end of last year I decided that while I have the safety net of unemployment benefits I am going to try to start a small home based business – but more on that later this week. There are some prizes in the offing so stay tuned. 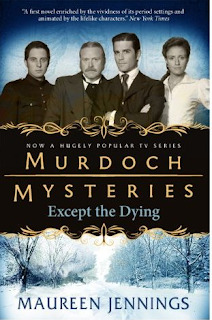 In the winter of 1895 Toronto acting Detective William Murdock is called out to a murder scene. A young woman is found naked in an alleyway. She is clearly not a lady of the evening and winter in Toronto is not a time anyone would be outside without clothing so obviously, this young woman met with foul play. William Murdock knows no boundaries when it comes to looking for a killer. He visits the lowest and highest echelons of society to look for his answers. And answers he finds through meticulous police work without the availability of all toys and whistles a reader might be used to in more modern police procedurals. This was Ms. Jennings debut book and it was an interesting read. It showed some good research into that era of Toronto’s history and the dialogue was excellent. There were a few slow spots, but I could forgive those. Having the hindsight of reading a few more in the series before writing this review I can honestly say the books improve with each addition to the series. The cover of the book is a bit deceptive as it pictures the characters from the television series. For fans of the series – be forewarned – the book is similar but definitely not the same. While the show is often humorous and tongue-in-cheek the book is deadly serious (pun intended). I did particularly enjoy the more in-depth look into Murdock’s life away from the police station. “Except the Dying” is well worth the read and I’m giving it 3.5 stars because I know the series improves in subsequent books. 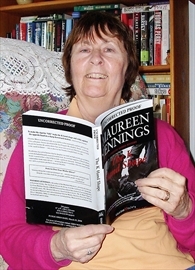 Born in England, Maureen Jennings taught English before becoming a psychotherapist. “Except the Dying” was published in 1977 followed by 6 more books in the series. Three of her novels were adapted into movies of the week and four years later Shaftesbury films created the Murdock Mysteries television series. Maureen lives in Toronto with her husband and their two dogs. When I went to check my mailbox today there was a suspicious package addressed to me. I wasn't too worried because it came from St. Martin's Press. I honestly didn't remember ordering anything and I wasn't expecting an ARC so I anxiously opened the box. What a great surprise! 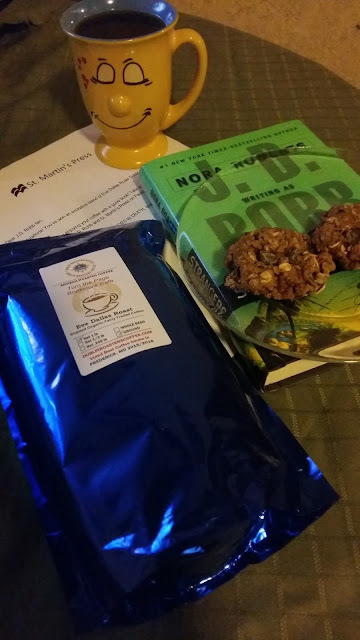 When I saw the contents I remembered entering a giveaway but didn't know I was a winner. 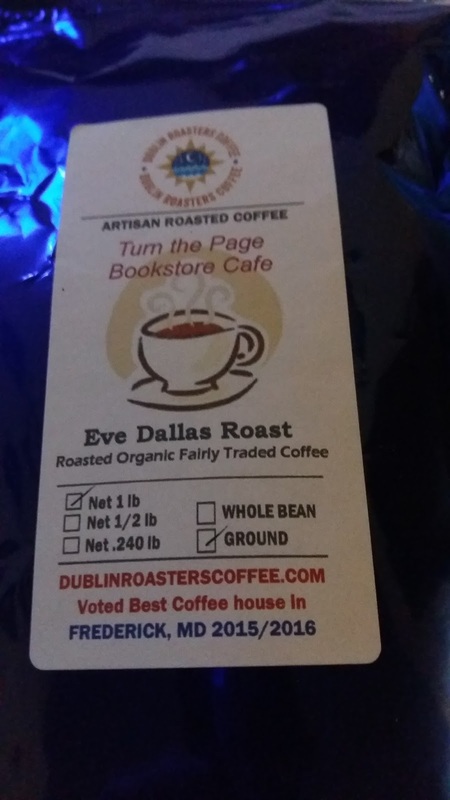 The box contained a pound of "Eve Dallas Roast - Dublin Roasters" coffee. Mmmmmm! Now I get to taste what all the fuss is about in J.D. Robb's "In Death" books when Eve looks forward to drinking her "real" coffee that Rourke procures for her. When I opened the package the aroma was amazing. And BONUS ... it's free trade and organic! Of course I had to brew some right away. It tastes as good as it smells and I had some cookies stashed away from baking I did on the weekend. Perfect! I am going to be quite greedy and squirrel this away for me. Okay ... I'll share with my BFF who is also a huge J.D. Robb fan. Thank you very much to St. Martin's Press and Dublin Roasters for the delicious surprise. This installment in the Pendergast series starts off at almost the exact point the last book (Crimson Shore) ended. 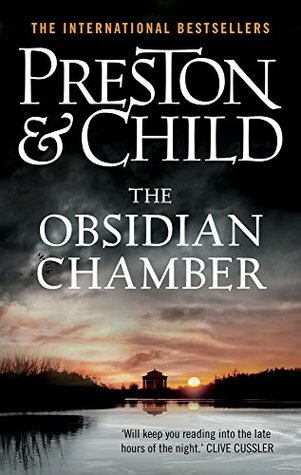 Pendergast is still missing and presumed dead, Constance goes into self-imposed exile in the chambers beneath the mansion and Proctor is standing guard. Standing guard until it seems as if Constance is kidnapped. A wild, cat and mouse chase starts the action moving in a non-stop, breath-stopping manner. When we discover that the chase is in fact a wild goose chase we return to the manor to find strange things afoot. 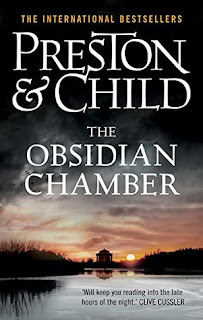 It’s no secret that A.X.L.’s brother Diogenes has returned from the (presumed) dead, this has been clearly hinted at in the last two books; the Obsidian Chamber confirms his return. To all outward appearance he comes back as a changed man. Is it too good to be true? Reports of Agent Pendergast’s demise are also found to be premature as he fights for his life after being fished aboard a boat manned by drug runners who know the bargaining power of having in F.B.I. agent in their grasp. Individually those three plot lines make up approximately half this book. Each plot line is suspenseful and interesting, so much so, that it kept me avidly reading to find out what happens. Unfortunately when the plot lines converge the story seems to lose some its momentum. I usually enjoy the novels that feature Constance at the center of the action and in the last two books it seemed that Constance had finally come in to her own. Obsidian Chamber seems to set her back a few steps and she becomes a strange hybrid of shrinking violet and ninja warrior. I still believe that Pendergast is one of the more original “agents” in thriller books and I enjoy his quirkiness and resourcefulness – almost a cross between the prim and proper Mary Poppins with her magic bag and McGyver with all the tricks up his sleeve. In this book I almost feel the book would have progressed better if he had just shown up and the end … everyone relieved that he was alive. Constance’s decision at the end of the book almost seems a step backwards and I fear the books will become a bit of a “rehash” with names changed to disguise repetitiveness. I hope not because I enjoy the series but the word “stale” popped into my mind on more than one occasion while reading this one. Overall it’s not a bad read but holds nothing in comparison to the early books in the series. 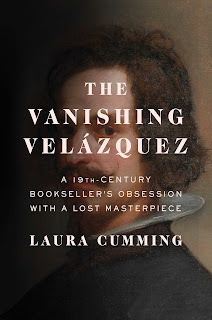 I received this book at no charge from the publisher, Grand Central Publishing via Netgalley in the hopes of an honest review. He is a Fellow of the Royal Geographical Society. In 2011, Pomona College conferred on Preston the degree of Doctor of Letters, honoris causa. He is an avid skier, mountain climber, and hiker. A dilettante by natural inclination, Lincoln's interests include: pre-1950s literature and poetry; post-1950s popular fiction; playing the piano, various MIDI instruments, and the 5-string banjo; English and American history; motorcycles; architecture; classical music, early jazz, blues, and R&B; exotic parrots; esoteric programming languages; mountain hiking; bow ties; Italian suits; fedoras; archaeology; and computer MMORPGs.